This is how Michael Phelps stayed focused during the Rio Olympics. In the summer of 2016, the Rio Olympics men’s 200m butterfly final provided us with one of the most vivid examples of what it means to “do you” and run your own race. The greatest men’s swimmer to ever live was going for another gold medal, and this time he’d be tested more than ever by one of his chief rivals, Chad le Clos. Phelps knew if he ran his own race that he’d win. But nothing was guaranteed. le Clos had emerged as one of the best butterfly swimmers in the world, even besting Phelps for the gold at the 2012 London Olympics. The competition was on. What it would come down to was, who was most focused and immersed in swimming their best race with complete concentration on themselves and no one else. As they say, a picture is worth 1,000 words. 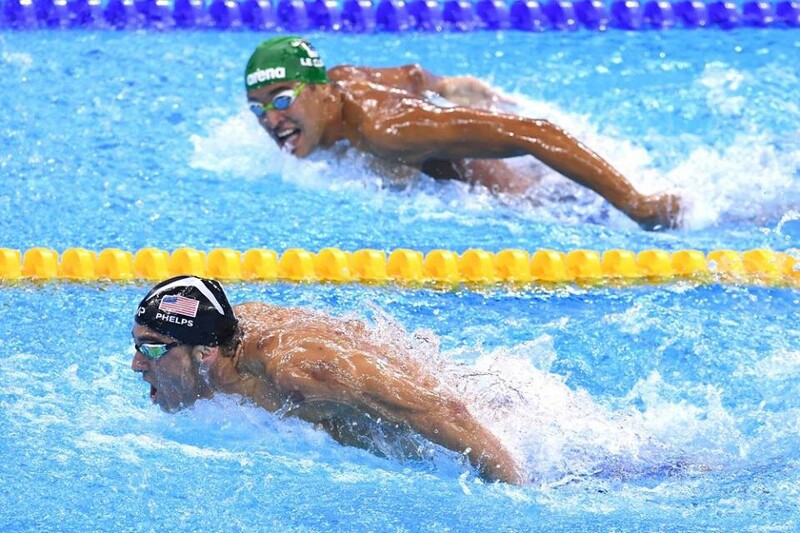 On the final lap, Phelps turned it on and passed le Clos. All of this was captured for eternity with a one millisecond look that said it all. le Clos was so focused and concerned on Phelps coming to take back his gold medal from the same event at the 2008 Games that he lost focus. He started worrying about his competitor. He didn’t even make it to the medal stand. Phelps kept going forward and focusing on the end goal. He won another gold medal and the moment became etched in time with a central, clear message: Run your own race. Don’t worry about what others are doing- especially if you find it turning into envy or frustration. You’re on your own path for a reason. Know your purpose, clarify your goals and keep powering forward with confidence and conviction. You won’t have to look over your shoulder at anyone to know you’re moving in the right direction. You’ll have all the knowledge you need that forging your path is the right way to go. This is true whether you’ve been training several hours per day for many years, or whether you’ve just pushed away from the shore on your maiden voyage toward living the life of your dreams. Think about it like this — even in the sporting world, namely an Olympic event like swimming where it appears it is set up that it’s “You v.s. Them,” there’s still the need to focus on running your own race. Competition is a very unique and ultimately sophisticated topic to digest. I put forth to you that you should focus on achieving competitive greatness and making it a value you should aspire to every day. But it’s equally as important to use that competitive energy on bettering yourself and focusing on doing the absolute best you can for yourself. The moment you start worrying or looking over your shoulder at what other people are doing, you lose focus. You lose time. What seems like a trivial second or two can completely shift the paradigm for how we see ourselves and what matters most. It’s truly about immersing yourself in whatever you’re doing and getting “in the zone” in an effort to be your best. As you begin to build an app, does it really matter where you know or don’t know if someone else is trying to penetrate the same market you’re after? I believe that answer is a resounding, No. Timing may matter in some instances, but the best product always wins. The best effort, combined with your natural talents, skills, goals, purpose and mission, is indestructible and all-powerful. When you’re trying to reach that VP job at your marketing agency, financial services firm or law firm, it’s truly about you and not them. Incredibly, so many of us fail to understand this. We waste time comparing ourselves to others, when the only comparative analysis we need is to measure our progress against becoming the absolute best version of ourselves we should want to be. Set goals. Set the bar very high. But don’t shift these things around for what you perceive others to be doing. This breeds envy and envy converts itself into frustration, anger, jealously, hatred and even laziness. Envy seems like it’s a convertible energy for good at first blush. But it always ends badly. I go back to where I started — focusing on two of the world’s greatest swimmers and the fine line between winning and losing. Winner focus on their race. Losers focus on the race that the winners are running, and when they do it’s usually with negative energy. So, don’t worry about looking over your shoulder. The race is directly in front of you. Go full speed ahead. Join my newsletter and check out my Amazon Bestselling book, The Value of You. This will give you inspiration to start planning for success on your journey. If you want to work with me, connect here and let me know how I can help you!